Universal repair tape with legendary uses by Soldiers and Aviators! 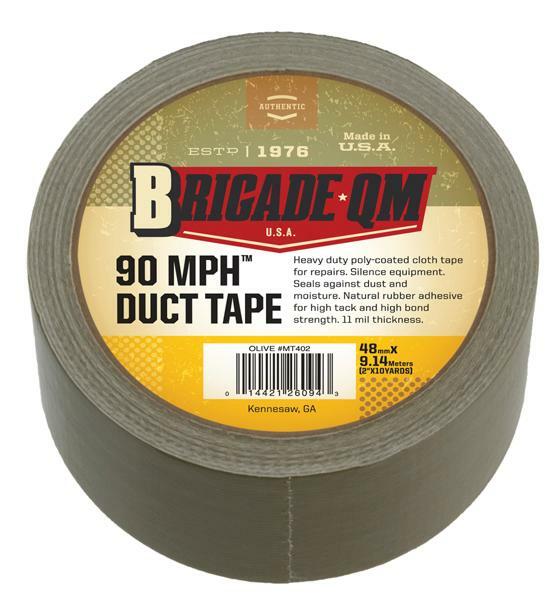 Brigade Qm's Army 90 MPH™ Duct Tape is a top industrial grade that is far superior to cheapie hardware store silver duct tapes. Known for its versatile use from silencing gear, to high speed repairs of nearly anything imaginable, cloth duct tape sticks to almost everything. Keep a roll handy at home, in your vehicle and in your camp supplies. The Brigade 10 yard (9.14M x 48mm) roll is more convenient for field use because it is rolled on a smaller core, only 2.25" wide.